﻿Golf School District 67 Foundation! 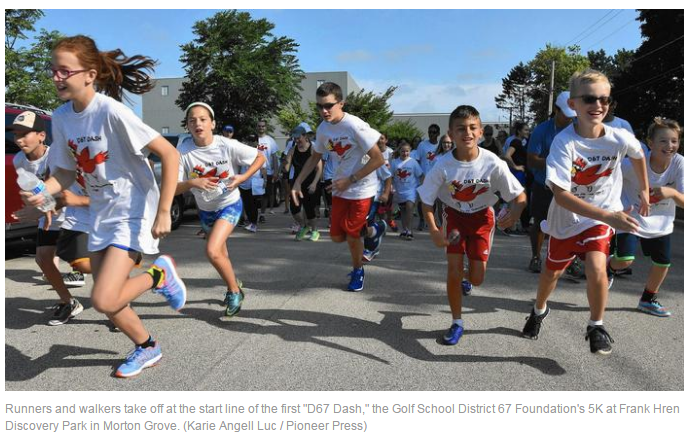 Approximately 165 people participated in the first-ever "D67 Dash," a 5K event for runners and walkers hosted Aug. 28 by the Golf School District 67 Foundation at Frank Hren Discovery Park in Morton Grove. "I like helping our school because it will give the school more money to buy equipment to help make our school better," said Molly Mehr, 10, a fifth grader at Golf Middle School. Shortly before the 5K began around 9 a.m. behind Golf Middle School in Morton Grove, the Sunday weather reached the middle 70s with humidity for the runners and walkers. Approximately 20 volunteers assisted participants throughout the event. The first-ever event was dependent on volunteers to make it a success, said District 67 Superintendent Beth Flores, who lives in nearby Lincolnwood. "It really takes a village," Flores said. "We had a lot of great volunteers who made this happen." 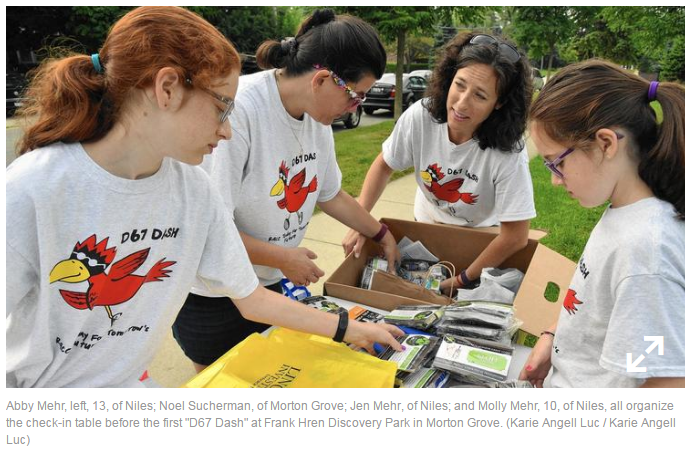 Volunteers Jen Mehr, of Niles, and Noel Sucherman, of Morton Grove, helped map out the 5K course before the event started. Mehr is a parent in the district, and Sucherman works as a teacher assistant at Hynes Elementary in Morton Grove. "We walked it to make sure the distance was safe and scenic," Mehr said. The amount raised during the event was estimated at $4,500, ending just shy of the $5,000 fundraising goal. All proceeds benefit District 67 students, said foundation president Caitlin Reichert. Inflatables and activity tables also were included for participants after the 5K course. "This was a huge success," said Reichert, a 2009 Niles North High School graduate. "We started [planning] last May, and this is a huge way to help students' overall well-being."